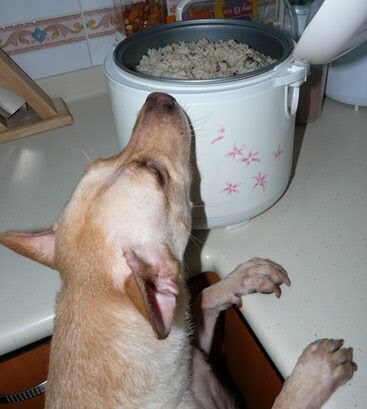 ...are definitely not enough for the wandering dogs on our streets, so I learned from my first stray feeding experience with volunteers from Noah's Ark CARES. It's not that I haven't fed the strays before. It's been a random act, to one dog, one cat, or a group of dogs, but never done in such an organized and large-scale manner. That vast industrial area in the north is regularly combed by two feeders from Clementi. Yes, Clementi! 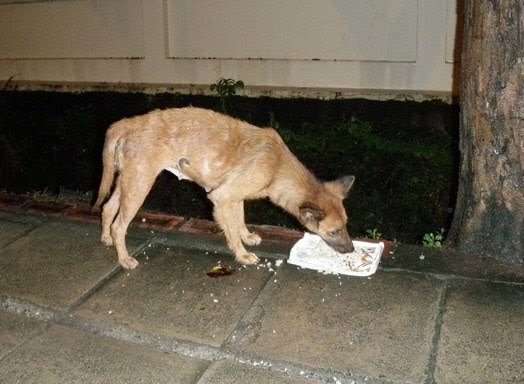 They feed, and if possible, they capture, spay/sterilize, and return the dogs to where they were found. It's a weekly commitment. We followed the feeders around the area, stopping when we see a dog, and offering food. Many were very excited to see the feeders, dashing out from their hiding place with wagging tails. Some even jumped up and down in joy. Inevitably, our food ran out fast, even though the two feeders had tons of donated bread/cakes, another two volunteers had chicken and rice, plus the food I prepared. When we reached the last few stops, we had to rationalize and portion carefully. At our last stop, I only had one scoop of food left for one dog. With my car door slightly opened, I sat in the car scooping out the last bit of food, and when I turned around, I saw two pairs of hungry but wary eyes staring at me (or rather at my food). They smelled food, wanted to eat but were so scared of humans. One of them even went underneath a truck parked beside us to get nearer to me. I felt so bad that we didn't have enough for the dogs at our last stop. Vincent and I decided to return two days later, armed with more food. I added more rice and some pork fat. And Cookie did the food tasting again. 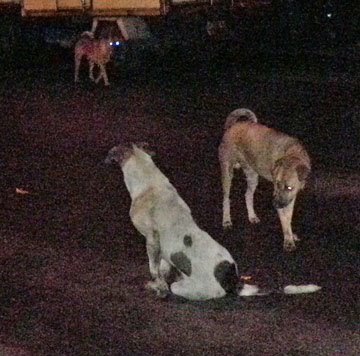 The second time round, we went straight to our last stop where we left two hungry dogs behind. They somehow remembered us! As soon as we turned in, we can see several dogs running excitedly towards our car, tails wagging. We fed them loads, 3 to 4 helpings, especially to one skinny dog which we nicknamed cow dog, because of his spots (picture below). After that, they played a little and that cow dog still came to us for more food! We were concerned that his stomach might explode so we refrained from feeding him more. Cow dog and his buddies looking contented after being fed. Back tracking to the stops we've been, we came across a female dog in a rather bad shape. We didn't see her on our first round of feeding. She looked sick, tired, and starving. There was a big scar on her belly. 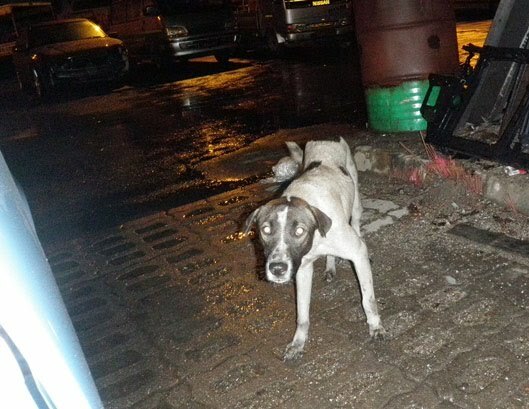 She was terrified of us but she managed to overcome her fear and slowly went towards the food we left for her. Everytime I refilled her food, she ran away, but returned for more. Poor gal. I also gave her 3 helpings of food and some water. Further down the road, we met a friendly dog which we later nicknamed as foxy dog. He was easy to feed and became Vincent's favourite. 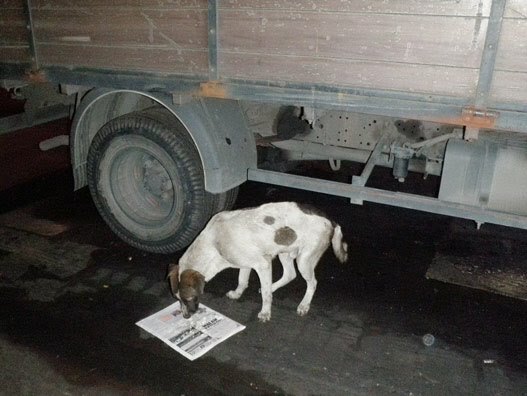 A worker returning to his dorm saw us feeding the dog and asked us to feed his dog as well. He whistled, and out came Lucky, a tall and thin mongrel resembling a grey hound. We didn't mind feeding Lucky, as the worker obviously treats his dog well to receive such a warm greeting from Lucky. We were left with one more portion of food, again. It's a déjàvu. And, we bumped into three more dogs! We had to make a choice to feed the skinniest one who was limping.